The next series I'm working on is the Main North Line and working south from Picton. Since the line is in the process of being reopened it seems like a good time to update the maps there. Most of the maps are already complete and in the main it is a matter of reincorporating new details that are shown on the very recent aerial photography that was done after last November's earthquake. However it is not feasible to show changes since then for the most part as this would need new coverage which I don't think will exist at the moment. Picton as seen a few years ago. Historical 1967 photo of Picton. At that stage the Aramoana and the Aranui were in operation; the World Bank loan to buy the other two ferries had not come into effect. The yard had had some changes but was still nowhere near the size of today. 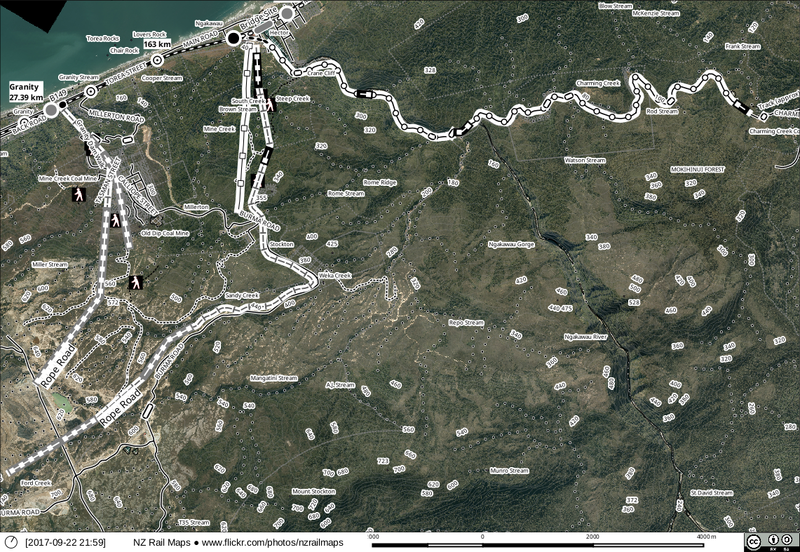 Having finished drawing the maps of this route here are some maps of different areas to finish this series of posts. Some of these have minor errors in them that have been corrected in the maps but I haven't regenerated these images. This one is specifically of the Charming Creek Mine tramway which is now a walkway but it also shows part of the Stockton Railway that was built for coal mining, and to its left the current aerial cableway that carries the coal down from Stockton at the present time. 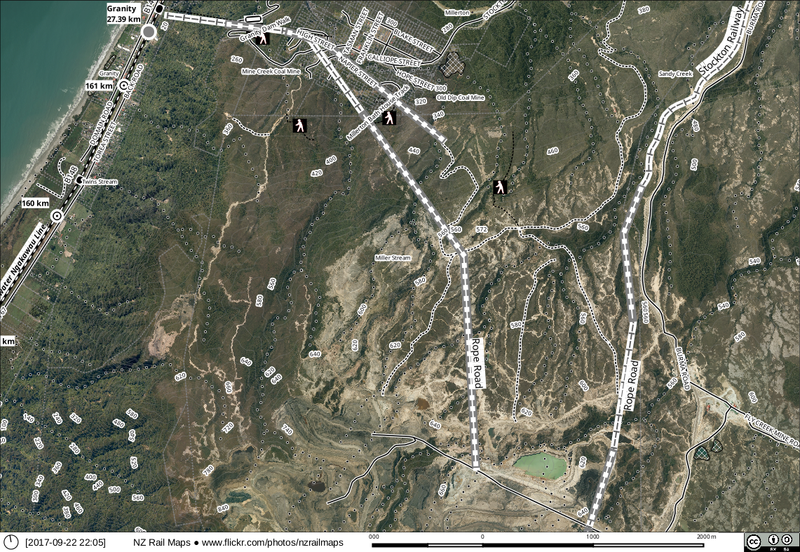 This is of the Denniston Plateau and it shows the aerial cableway that operated for 15 years as well as the roperoads and the major mines of the area. 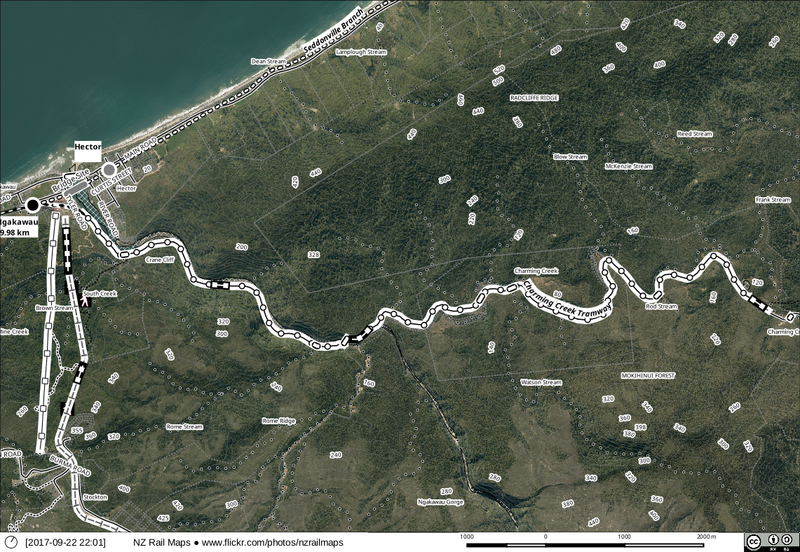 This one shows the area around Waimangaroa including the Koranui Incline and the Denniston road and bridle track, also the Denniston Incline. This shows the full Stockton railway, some of the haulage roads for the mines in the area, the Millerton incline haulage roads etc. Here we can see the route of the Stockton railway and the aerial cableway. At the bottom edge we can see the township of Millerton. 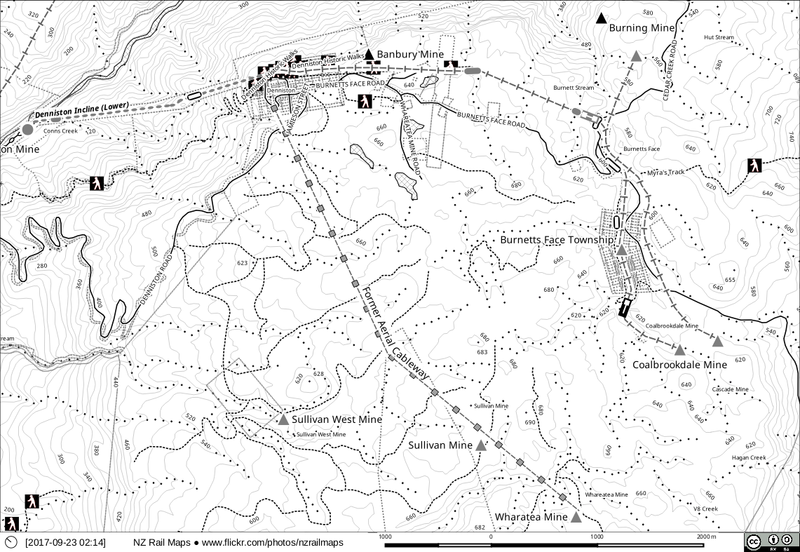 This is detail of Millerton and the incline and haulage tramways (rope roads). This is Ngakawau, the terminus of the Stillwater Ngakawau Line. This started out as a station 2/3rds of the distance from Westport to Seddonville (the distance shown is the distance on the Seddonville Branch) but has become now the end of the SNL. The bridge that until 1981 took the line across the Ngakawau River to Seddonville can be seen. This was built and used as a combined road and rail bridge until some time in the 1930s. Where the line ends is where the Charming Creek walkway starts. We can also see where the Stockton tramway started and went through a tunnel as it climbed up the hill. Unlike the incline at Millerton which was a rope road with an endless cable that hauled the coal skips down to the Granity station, the Stockton tramway was a normal rail line (narrow gauge) hauled by electric locomotives with overhead collection poles. It was used until the 1950s when the aerial cableway was put in. It's obvious that things have slowed down a little bit lately. This has been due to having to address some unplanned issues elsewhere. Whilst there is room for some regret that the work slows down during these times, it's fortunate that I have got some leeway with the dates when I originally thought that the map drawing would all be finished by the end of this year. However, it is undeniable that finishing the maps next year will be slower than the past few years. It may well be that the pace is similar to what has been happening for the past few weeks. 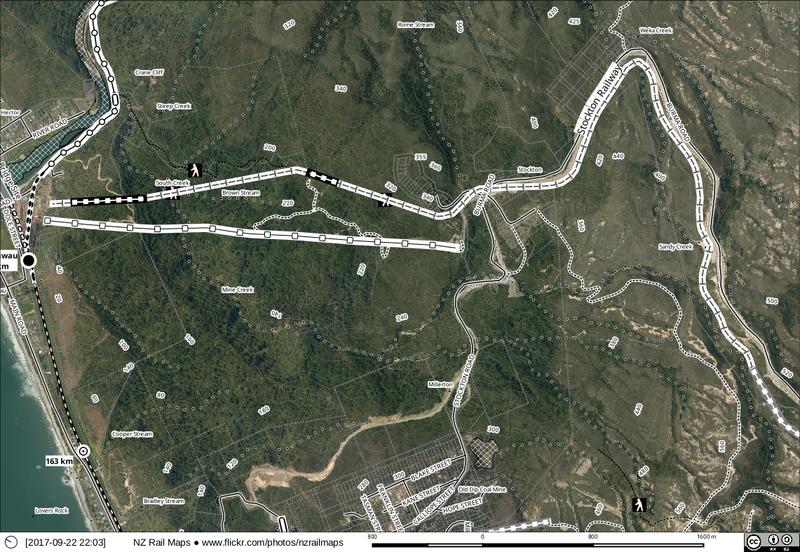 I have finished drawing the maps for the main line all the way to Mokihinui Mine. What has been happening more lately has been adding a few other details here and there such as mining sites and infrastructure. This is still happening slowly and it will take time to finish looking at Ngakawau, Stockton and Millerton as well. Software wise the main work of the maps project is still happening with Qgis 313ec55 now built from source on a Debian 9.1 vm which does everything really well with no real issues. I am still experimenting with later builds of 2.99 but there is a memory usage problem with the most recent releases that makes it difficult to draw maps off aerial photos. Fixes can take a while to come through so I am waiting for this to be addressed hopefully soon. 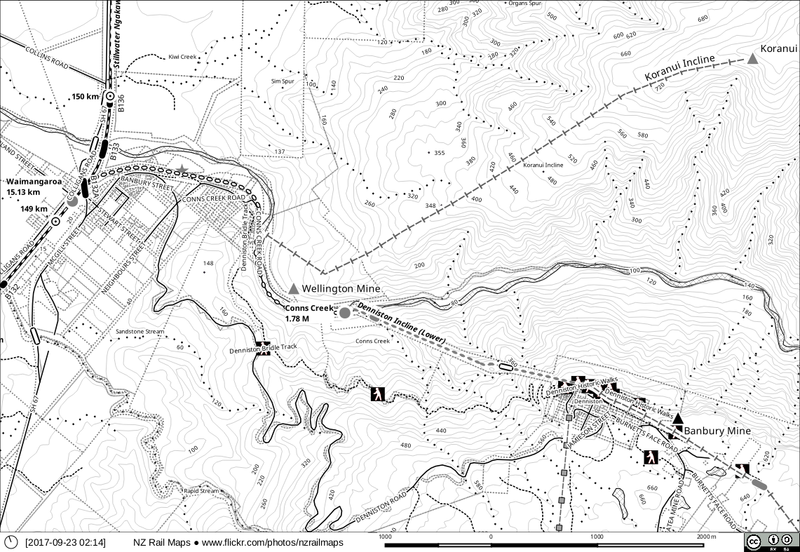 Whilst I have taken a break from this for a few weeks to draw the Nelson Section maps, I am now back into it and pushing the maps up to the 150 km peg just beyond Waimangaroa. But that part will have to wait until the next post, right now this post is about the Westport area, and parts immediately both to the east and west of Westport. This post has actually taken a couple of days to write. The text only took a couple of hours work but the maps took a lot longer because of discovering and documenting bugs in the software. Due to lack of time therefore this post has been split into two parts, the rest of the maps and photos will be in the second part. That part to the west consisted of the Cape Foulwind branch line, which started its life as an industrial railway built by the original Westport Harbour Board in 1886 and its key purpose was to carry stone quarried from the cape to Westport where it was used to build the harbour moles on each side of the harbour entrance. To this end, trestling was built out into the sea and the rocks were tipped each side of the trestle until it was buried. This system was used to build up moles (or breakwaters) at the entrance to a number of harbours around NZ, the ones that immediately come to mind are Greymouth, Gisborne and Whanganui and probably some others as well. Filling in trestles by tipping from wagons was also how big railway embankments, generally on main lines, were built during line construction where the PWD had locomotives available (branch lines were often built by purely pick and shovel work especially in the 19th century) in the days before heavy road building machinery was able to do these tasks. To get the railway from Westport to Cape Foulwind and also access the railway to the mole on the far side of the port, a large bridge across the Buller River had to be built. Some considerable number of years ago I researched the extent and history of all the combined (road and rail) bridges on the Coast and from this I gleaned the information that the bridge was completed in 1888 (so the railway was built first) and it cost 14,000 pounds, or in today's money, about $3 million. It was 1040 feet long (316 metres) which consisted of 13 spans each of 80 feet and it had wooden piles founded into the river bed, while the spans were made of wrought iron. John McLean & Sons were the contractors who built the bridge (and possibly may well have built th rest of the railway) and they had their own interesting history; most notably as the company that started the construction of the Otira tunnel, which bankrupted them. The company had a long history in NZ with the McLean brothers having emigrated to NZ in 1860 originally from Scotland via Nova Scotia (Canada) as members of a Presbyterian religious community known as "Normanists", after its founder, Norman McLeod. John McLean set up his firm in 1870 and it was taken over by the sons, Neil and Murdoch, in 1886, so this bridge contract was one of their first undertakings as the heads of the business. They went on to become quite a major company and had their share of successes and failures; they built part of the Rotorua branch line and the Makarau tunnel on the North Auckland line. The Makarau tunnel, which is still in use today, was built through extremely treacherous ground (Onerahi Chaos) and resulted in the company petitioning Parliament to be released from its contract - a similar scenario to Otira. After the failure of the business at Otira, the brothers continued in contracting but on a much smaller scale; Neil McLean retired in 1921, whilst John died in 1917. The Buller Bridge was opened to road traffic as well as the trains carrying their loads of rock to the eastern mole of the harbour. Periodically these were extended and there were major projects for this work on several occasions, the most recent occasion being in 1967. 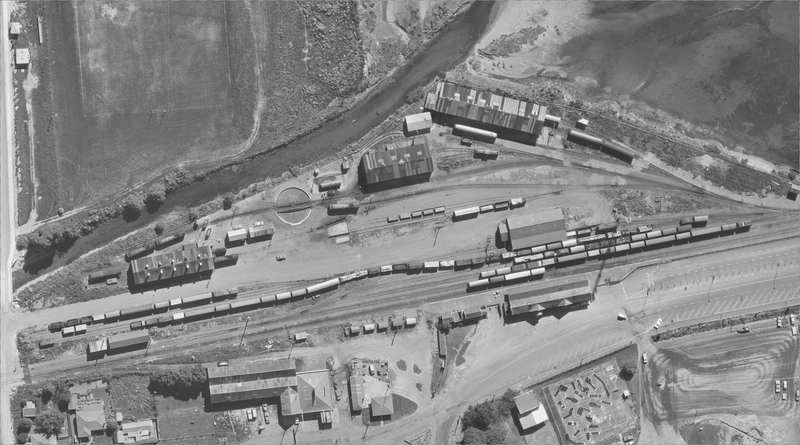 The harbour was carrying a heavy volume of coal exports for as long as the Stillwater Westport Line was incomplete; the coal was mostly mined in the various settlements east of Westport and transported via the Seddonville branch line to Westport for shipping. When the SWL (or as we know it today the SNL, the subject of this series of articles) was finally finished in December 1943, the future decline of Westport as a harbour was almost guaranteed. This was further aided by the realisation, which still took a further number of years to be accepted, that the massive sediment flow passing northward up the coast across the harbour entrance built up the seabed at a far greater rate than dredging could ever hope to reverse, and building longer moles out into the sea was but a stopgap measure until the channel captured by the new extension also filled up. For some numbers, it has been estimated within the first 50 years of building the harbour that every year some 500,000 (yes, half a million) cubic metres of material was building up on the seabed near the harbour entrance. 1 cubic metre is a volume of 1000 litres. The result over the same period was that the shoreline advanced on average about 7 metres a year. Hence, it has been realised that the harbour in its present location could never hope to remain deep enough to accommodate larger ocean going vessels for very long. 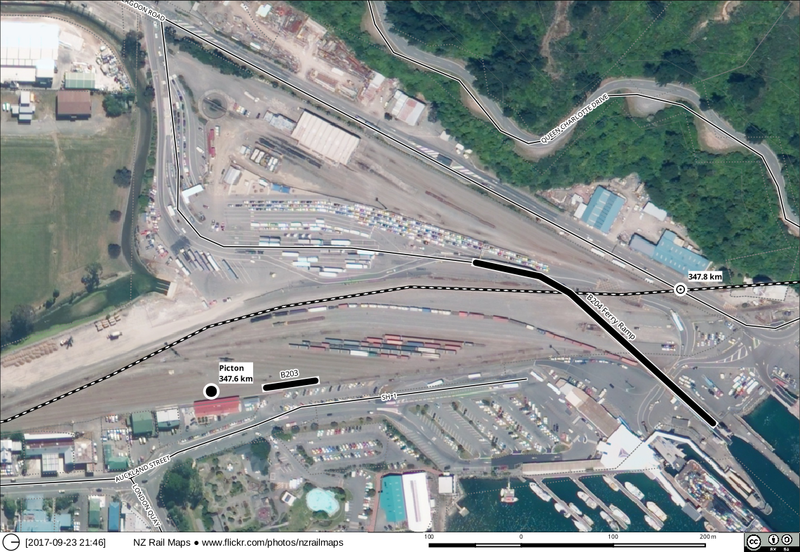 There have been a number of subsequent proposals for a new deepwater port at Westport, most recently in the late 1980s when the then Labour government decided in favour of rail. Since then the port has declined further and Holcim closed down their Westport works a couple of years ago as it was becoming difficult to ship cement out of the port. The economic decline of the West Coast as a whole can be firmly cemented to this lack of suitable deepwater ports. There is a fond notion in NZ's rail industry that land based transport is a viable means of supporting the West Coast and that this mode should prevail against shipping alternatives. Unfortunately it is a fact that whilst rail is certainly cheaper than road transport for volumes, land based transport is always going to be more expensive than sea at very large volumes. Rail is the only option at present for the West Coast in the present day scenario where politicians have been unwilling to fund the development of viable West Coast ports, but the development of the Stockton mine traffic has proved to require substantial investment in rail infrastructure that Kiwirail has been reluctant to fund because Solid Energy was unwilling to pay a reasonable rate of freightage on the coal traffic; SE in turn claimed Kiwirail's rates were too high over the long distance involved. Thus while foamers drool over the coal train traffic and the spectacle of five or six massive diesel locomotives (3300 hp each) in multiple that drag the heavy trains through the Otira Tunnel daily, the operation is detested by Kiwirail locomotive staff who have long lobbied for a new electrification project for the tunnel (which until 1995 had 1500 VDC overhead and five dedicated electric locomotives, abolished because they were incapable of dealing with the increased train size). Anyway...the Westport Harbour Board after carrying out many of the early harbour works, ran out of money and in 1921 the harbour came under the control of the government's Marine Department. This resulted in the Cape Foulwind line being handed over to the Railways Department. 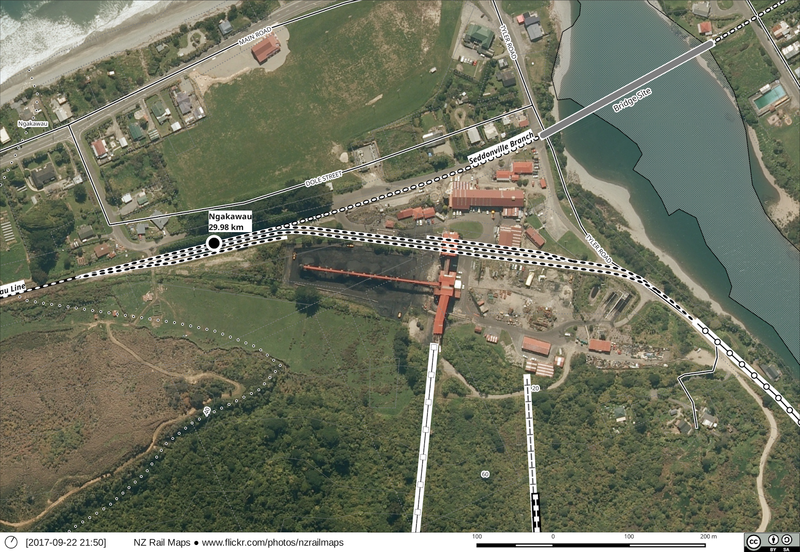 The quarry lines having been extended as far as Tauranga Bay in 1914 with a tunnel; this extension closed in 1923, after the new quarry had helped contribute to an extension of the harbour moles by 600 feet each. NZR eventually decided the line was unviable as a general purpose passenger and freight railway, and closed it in 1930. It was then handed back to the Marine Department who continued to operate it until 1940. The Buller bridge needed major repairs in the mid 1920s with more piles driven, and again in the early 1950s. There was still track in place at this time but the bridge was now too weak to run trains and in all probability the rails on the bridge itself were taken up when the bridge was rebuilt because the decking had to be lifted to drive piles through, and a photo from that period shows no track. New decking was needed in 1968 and remediation of the trusses and piles was needed in the early 1970s. Work to build the present two lane highway bridge began in 1974 and took about two years; the old bridge was dismantled in 1977. The bridge spans have been kept on the Coast for other temporary projects. There was a second, much smaller combined bridge at Bradshaws Creek just west of the Buller River. A new road bridge was built alongside some years after the railway closed. The bridge itself was still there into the 21st century but is now gone. Foamers have long suggested that if the cement works at Cape Foulwind had been built before the railway closed, the railway would have remained in use until the modern day. However, the cost of a new bridge across the Buller River, or maintaining the old one, for such a short run into the port of Westport, would likely have been considered uneconomic. Holcim only transported a small volume of cement long distance by rail. This product was trucked to the private siding just outside Westport (referred to in the last post in this series) to be taken across the Southern Alps to Christchurch. Most of Holcim's product has always gone by coastal shipping with their own fleet of cement carriers travelling around the country for many years. This system continues today except that the cement is imported from overseas to Timaru. General overview of Westport. Note how much of the moles doesn't stick out into the sea, the constant flow of sediment around the entrance has built up a lot of land resulting in the difficulty of keeping the entrance into deep enough water. The first part of the Cape Foulwind branch line with the two combined bridges. Looking at the quarry section of the branch line, this was the main quarry where the rocks were loaded into the wagons. Machinery was based in there and several cuttings were made to get tracks in. This is Tauranga Bay where a quarry was put in 1914 to get more rock. There was a tunnel put through. Apparently the tunnel is partially collapsed. An overall map of the Cape Foulwind branch railway. Some of the sites formerly used by Holcim can also be seen.